Roads are critical to human life. You probably traveled on one today, whether you were walking down a dirt path to your farm in the morning or commuting to work on a bumper-to-bumper expressway. Roads link us both literally and figuratively: Even as they transport us from place to place, they connect us to locations and communities we may never visit. Roads also serve as indicators of human activity across the planet. They enable industries and urban centers to flourish, sometimes in regions that were previously sparsely inhabited. They determine whether communities are easily accessible or nearly unreachable. While roads can benefit regions and populations, they can also create environmental pressures and traffic, degrading health and the environment through air pollution. Satellite images of the planet after dark can help us to better understand roads of all kinds. VIIRS Nighttime Lights data from 2016 shows human-generated visible and infrared light across the world at night. (It’s composited from the best cloud-free nights in each month of the year.) These lights give us a unique view of the interconnectedness and impact of human life on Earth. Often, the shortest route between two points is considered the road best traveled. But some drivers making the trek from Bengaluru to Chennai, the nearest port city in this region of southern India, disagree. The southern route is about 19 miles longer than the northern route, which is often referred to as “Old Madras Road.” (Madras was the previous name for Chennai.) Yet more people travel on the southern route, and it is therefore more developed than its northern counterpart, as this night lights map reveals. It all comes down to money—specifically, tolls and permits. In 1956, the Indian government reorganized the states along linguistic lines. This meant that Madras state, where Chennai is located, was split in two. Therefore, the northern route from Bengaluru to Chennai, which had previously passed through only two states, now went through three newly created states: Tamil Nadu, Andhra Pradesh and Karnataka. Suddenly, the same commute came with a higher price tag. Drivers either had to pay three sets of state tolls or purchase permits to drive in each state. The longer southern route, bypassing the newly created states, offered a cheaper alternative and became the more popular means of traveling to and from the coast. Trans-Arabian pipeline and Highway 85. We tend to think of roads primarily as a way to travel from place to place, but they are often developed with other goals. Consider Highway 85, which runs through northern Saudi Arabia and neighboring countries. Much of Highway 85 travels in nearly a straight line, and some of its sections are among the longest straight roadways on Earth. This is because the highway was built not to connect cities, but to help transport oil. Now defunct, the Trans-Arabian Pipeline was a major petroleum transportation line built in the late 1940s. It moved oil from Qaisumah, a village along Saudi Arabia’s Gulf Coast, to Sidon, the third-largest city in Lebanon, a distance of 754 miles. The road was built along the pipeline’s route, creating a simple way to service it. While the hot, dry region might not seem hospitable, workers flocked to the area for jobs maintaining the pipeline and working in affiliated pumping stations. In fact, Arar City in Saudi Arabia was built by the pipeline company to ensure the presence of a city large enough to house the workers required to service the project. 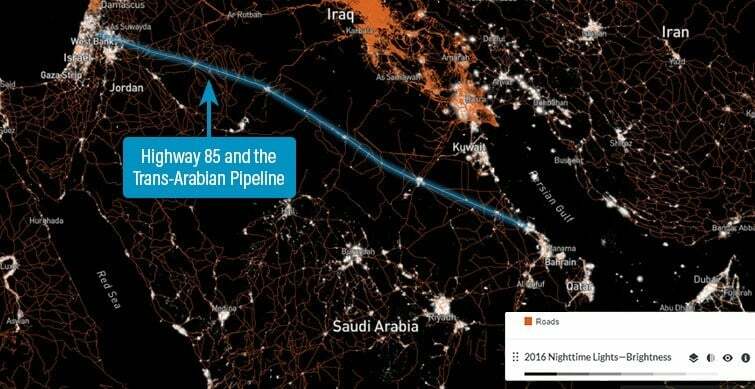 Much of the pipeline wasn’t used past the 1970s, due (at least in part) to conflicts among Lebanon, Israel, Jordan and Saudi Arabia, the four countries through which it passes. It was shut down entirely in the early 1990s. However, despite the rugged environment, many of the urban centers that grew along the oil transportation route still exist. Since most of the towns and cities were developed to serve the pipeline, they are not well-connected to other urban areas in the region. As a result, many of the people living along Highway 85 find themselves isolated from cities that are close in proximity, such as Baghdad. Even as new roads connect populations and parts of the world, they can simultaneously enable environmental destruction. This is often the case in the Amazon, where roads cut through remote areas of the world’s largest tropical rainforest. The night lights data above shows the human activity along Highway 364 in Brazil’s Rondônia state. Tree cover loss in the Brazilian Amazon often follows a “fishbone” pattern off major highways like this one, as additional roads and farms are established along the main road. (The pink layer in the map above shows tree cover loss in the area from 2000 to 2016.) In some nearby regions, as the soil began to erode, farmers used the previously deforested land for pasture and cut down other sections to plant crops, continuing the pattern of deforestation. Roads in remote areas of the world also open new areas to the extraction of natural resources, such as timber and minerals. Even a few roads cutting through a previously isolated area can have a huge impact on the environment. Night lights data helps us explore the unique, and often surprising, stories behind the world’s roads. Discover more using the Nighttime Lights 2012 and 2016 layers. Mikaela Weisse advised on patterns of tree-cover loss in the Brazilian Amazon rain forest. Which Foods Produce the Most Emissions? 4 Maps Reveal the Future of the Ocean Which Foods Produce the Most Emissions?